IC 443 (also designated as Sh2-248) is a supernova remnant in the constellation of Gemini. 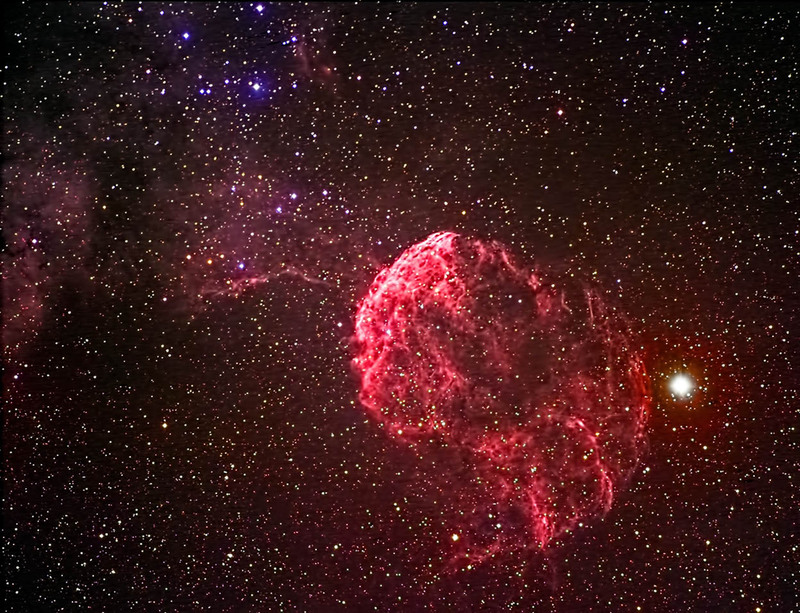 It commonly referred to as the Jellyfish Nebula. It lies approximately 5,000 light years away and spans 70 light years. It is believed to have been created between 3 and 30 thousand years ago. It's non-symmetrical shape is due to its interaction with nearby gas clouds. The bright star to the right is Eta Geminorum. Exposures: Ha: 22 @ 7.5 min.Color: 22 @ 5 min. Processing: Ha images were captured, aligned, and combined in CCDSoft. Color images were captured, aligned, and combined in ImagesPlus. The Ha and color composite images were combined and adjusted in Photoshop. Topaz Detail and DeNoise filters were applied to the final image. Location: My backyard observatory in southeastern Minnesota on 3/23/19 and 3/25/19. Temp: 25 F.